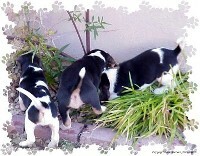 Looking to adopt an AKC Beagle puppy or want to breed your female Beagle with our AKC registered Beagle stud? Then you came to the right place. We are located in Chandler, Arizona and have raised Beagles since 2000. All of our Beagle puppy adoptions come with a written contract, detailing our health warranty, return policy, limited AKC registration and helpful hints on raising Beagles. In addition, you receive a Puppy Kit, containing all the basic essentials to get you started. See our Beagle adoption page for further details. If interested in a future litter, please fill out our Beagle ADOPTION FORM to place your name on our waiting list. After we have a litter, we turn on the live streaming PUPCAM during the day, so you can monitor puppy development and watch the other adult Beagles in action. You can see the images and videos of current and past litters in our image LIBRARY! EMAIL US if you are interested in adopting a Beagle puppy, breeding your female, or have questions.